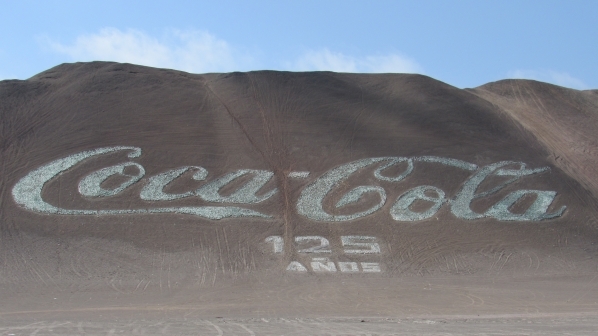 Contest #576 – Coca Cola Logo near Arica, Chile – Where On Google Earth? In 1986, Coca-Cola turned 100 years old. The company’s affiliate in Chile decided to commemorate the anniversary by building a copy of the logo that read “Coca-Cola: 100 Años” They used 70,000 empty bottles, arranged in the sand over a 400×150 foot area. In 2011, the company went back, cleaned up the 25 years of damage, and changed the subtitle to “125 Años”.